I don’t know about you but when I started fishing I always wondered why there was only one guy standing out on the beach fishing when the rest of us were packed in the jetty. 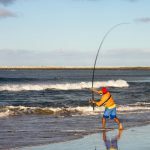 Surf fishing is a little different to fishing from the jetty and you will probably need a few extras, including a surf fishing rod if you want to have a decent go at it. Surf fishing is exactly that. Fishing from the surf on a beach. Both live bait and artificial lures are used for surf fishing. While fishing waders are often used by those who surf from the beach, it is important that you wear a tight belt to seal them off. You don’t want them to fill up with water and you get carried off into the ocean wearing them. It is dangerous to wear waders in large bodies of water without wearing a belt. Casting into the surf takes a little practice, just like all casting. There is only one way to get the hang of it and that is to give it a try. The fishing rods used for surf fishing are generally much longer than those used for fishing on a jetty, for example. It is common for a surf rod to be longer than 12’. That’s definitely not the longest length by any stretch of the imagination. A longer fishing rod is required because you will need to cast further over the surf. 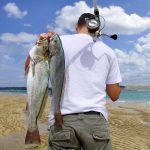 It is common to see anglers casting from the beach with both hands and putting their full body into it. 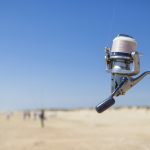 While there are a lot of surf fishing reels available on the market, I highly recommend using an existing saltwater spinning reel until you need to invest in anything more. This way you can use the general purpose fishing reel you already have while you find out if surf fishing is for you. 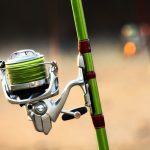 If you are new to surf fishing, I highly recommend pre-rigged setups. Just like any fishing, it takes some amount of knowledge before you can become proficient at setting up your own rigs. I highly recommend talking with others who are fishing in your local area to find out what works for them. Getting to know the lay of the land is also important. You can do this when the tide is low. You can check out the fishing area of dips, sandbanks and structures. You are looking for places where fish will be hiding and looking for their own prey. You can’t go wrong with live bait when surf fishing. I highly recommend using live bait to suit your local environment. Live bait can be found on the beach or you can buy it at your local tackle store. I’ve found that using live bait is a good way to get out there and find out what artificial lures work best from other anglers when first getting started. 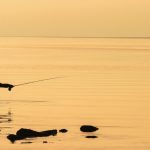 High tide is a great time to fish because this is the time when many fish come in to feed, especially when high tide happens early in the morning or the evening. You will need to take care at this time of day, especially if others are about. 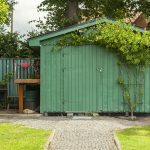 Fishing rod holders and anchors are worth buying outright. These days they are so affordable and so well designed for doing the job. Using anything else, such as an esky, is just asking for trouble. The last thing you want to see is your fishing outfit going for a ride because you didn’t have anywhere to put it when taking a short break. Surf fishing can be more dangerous than it first seems. You should always watch out for rip currents and incoming tides. Make sure to watch out for anyone swimming near you. And because being safe is better than being sorry, it is always important you let someone know where you are going and when you will be back, especially if you are out fishing on your own. That’s the basics of it. If surf fishing looks of interest to you, I say get out there and give it a try.